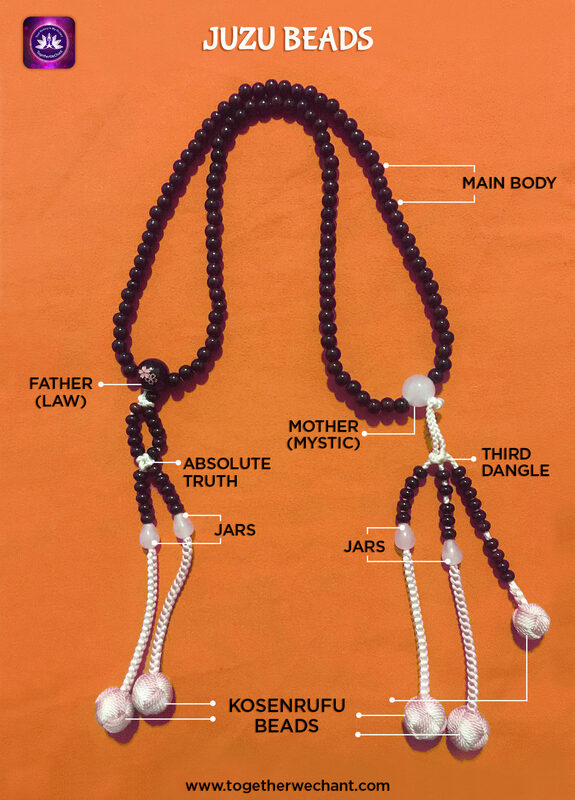 JUZU BEADS – Let’s get to know these Prayer Beads even better! Juzu Beads are prayer beads held in the hands, in this practice of Nichiren Daishonin Buddhism, as we chant Gongyo & Daimoku. From my experience, I feel it keeps one alert with full concentration as we hold the beads in our hands and focus on the recitation of The Lotus Sutra, “Nam Myōhō Renge Kyō”. These are not just about any prayer beads but have a special significance in the way they have been designed. A small differently colored bead on each of the 4 dangles, which is preceeded by 5 smaller beads each. Represents our firm determination and desire to spread The Mystic Law (kosen-rufu) throughout the World. As we show our “oneness with The Mystic Law”, we are careful not to let the benefits of our practice fall off through our hands and our lives. We wholeheartedly accept the truth that Buddhahood exists within each of us in our lives. As we hold the Juzu beads in our hands and press them together in prayer form, our 10 fingers represent the 10 worlds which coexist in the life of a Buddha at any given point in time. We are the Buddha and so our life then becomes one with The Mystic Law. People in this practice make it a point to always chant with these Juzu beads in their hands, and some people even rub them quite often as they chant. I believe this is just to bring back their concentration if the mind wanders, which is very normal. So let’s start chanting and bring abundant good fortune & victory into our lives as well as the lives of so many others that we already know, along with those that we will come to know in future. The information in this article has been gathered through articles available online but is in no way a replica of the same.